Demonstrators at Hartsfield–Jackson Atlanta International Airport in Atlanta on Jan. 29, 2017. Today on “Political Rewind,” another weekend of controversy for the Trump administration as the new president signs an executive order for "extreme vetting" of immigrants from seven mostly Muslim countries. 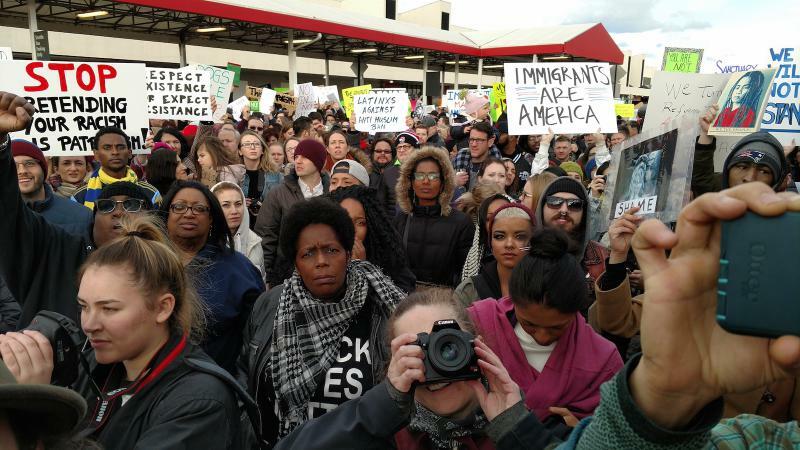 Protest rallies erupted at many major airports across the country, including Atlanta's Hartsfield Jackson International Airport. Senior Pastor Bryant Wright of the Johnson Ferry Baptist Church in Marietta, Georgia joined our show live to discuss his continuing mission to support and foster immigrants in the Atlanta area. We also heard from a number of Georgia political leaders including former congressman Jack Kingston and Atlanta mayor Kasim Reed. The panel also discussed President Trump's impending Supreme Court pick, which he says he will announce on January 31. Will Senate Democrats filibuster this potential nominee? And is Georgia judge William Pryor a contender? Also, State Sen. Josh McKoon announced today that he will not seek reelection to the Dist. 29 seat; does this mean he is leaving politics or preparing to seek another office?